The dramatic changes to Kansas tax policy have yielded a looming budget crisis, significant funding problems for public schools that will get worse, a greater tax burden for low-income Kansans and, at best, middling economic gains. So, I’ve been wondering: How do you sell such a thing? How do you get Kansans to believe the tax plan was positive? If the sales pitch was whittled down to one sentence on a campaign brochure, what would it be? After a recent barrage of national media stories about the Kansas budget — including a very good article from the journalistic side of the Wall Street Journal as well as Columbia Journalism Review's look at all the recent media coverage — after all that, the WSJ opinion piece asks Kansans to look away, to wait longer, to ignore the bad stuff...suggesting all the while that it’s not really so very worrisome. First of all, the numbers are wrong. The WSJ produced the much-too-high $112 million number, not the Kansas Legislative Research Department (*see note below). What an understatement! What does that really mean? A quick outline: To keep the Kansas State General Fund solvent, lawmakers surely will have to limit spending — by hundreds of millions. The education and human service programs that make up almost 90 percent of State General Fund expenses will bear the brunt of the cuts. The last phrase of the above WSJ quote implies that Kansas has been a big spender — also not accurate. FY 2010, the beginning point for their measurement, was the depth of the Great Recession when programs had to be cut to the bone. Go back two years earlier (*see chart below). FY 2014 spending was actually below the spending level of FY 2008 even though Medicaid and retirement system costs increased steadily throughout that six-year period, including during the recession. Those expense increases were covered with cuts to other programs. The base state aid per pupil in the school finance formula dropped substantially, and some costs were shifted from the State General Fund to other funding sources, like the highway fund and the gaming revenue fund. In FY 2015 lawmakers mostly ran out of ways to offset required cost increases, and approved spending that they likely knew exceeded even optimistic revenue estimates, by more than $300 million. Medicaid and retirement system costs will keep going up. The state does not have a choice about paying those bills. But more cuts are in store for other programs. The unsigned WSJ article implies that anyone critical of the extreme Kansas tax policy is trying to discredit it out of worry that the policy will actually succeed. Really? Are they kidding? Here in Kansas, we are worried that the state will face a long, long recovery from the fallout from the 2012 tax policy. * The Kansas Legislative Research Department (KLRD) has not released an “actual” ending balance number for FY 2014 or a new ending balance forecast for FY 2015. 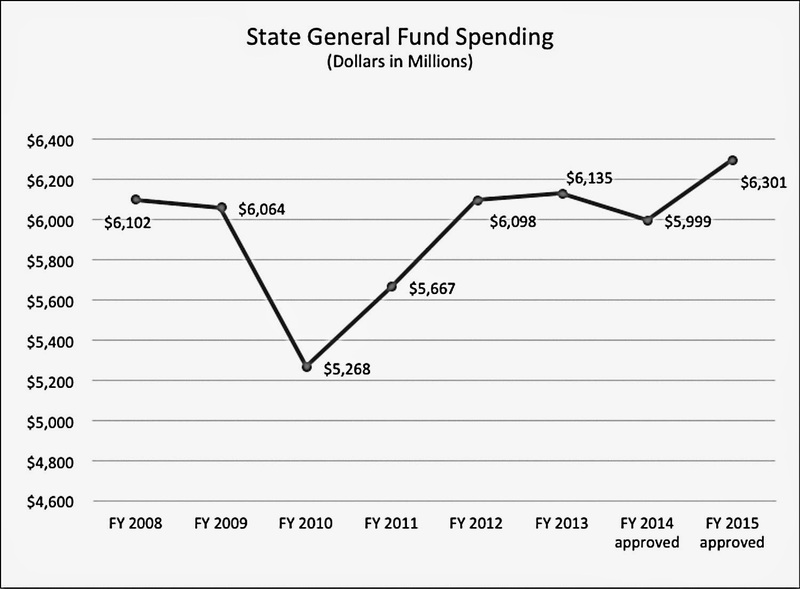 The state budget office released the FY 2014 ending balance figure of $434 million, but without any supporting information about actual spending in FY 2014. If the $434 million turns out to be accurate, that quite likely means that millions of dollars in bills and expenses have been held over for payment in FY 2015, which would leave the FY 2015 ending balance just above zero even when using the overly optimistic “official” FY 2015 revenue estimate. It may take a week or two before this information is available from KLRD. Stay tuned. In coming days, we’ll look at school finance in Kansas, and then at the tax burden to low-income Kansans.